The Lectionary provides a wealth of Scriptural inspiration for this weekend’s celebration of the gift of the Spirit at Pentecost. Genesis 11:1-9. This the Tower of Babel narrative. Holy Mother Church suggests this reading because it is a kind of “bookend” near the beginning of Scripture that pairs with a “bookend” near the end of the Scriptural story: Pentecost. Notice the contrast and comparison between Babel and Pentecost: in both cases, all humanity is represented (the list of nations in Gen 10 is roughly summarized in contemporaneous terminology by St. Luke in Acts 2:9-11). In both cases, there is confusion because of speaking. At Babel, they are confused because they do not understand. At Pentecost, they are confused because they do understand. The Tower of Babel tells us how mankind was fractured. Pentecost tells us how mankind is reunited as a family: by the Spirit, which forms the Church, which is the new Family of God. Notice that at Pentecost, Peter’s leadership and preaching is highlighted (Acts 2:14-42). Peter’s role in the Spirit-unified Family of God is crucial. Without his leadership, the Family breaks up into autocephalous communions or various denominations. Only where his Spirit-empowered leadership is respected does the Family maintain its transnational unity. Exodus 19:3-20. The Sinai Narrative. The reason Holy Mother Church suggests this reading is that the Jewish Feast of Pentecost—which literally means “Fifty”, taken from the fifty days counted after Passover—was the Jewish liturgical celebration of the Giving of the Law at Sinai. This parallel and its significance is missed by modern readers, but not by ancient Jewish readers of Acts! At Sinai the Law was given in a fearsome storm, and on tablets of stone. At Pentecost, there is a “peaceful storm” of the Spirit (the rushing wind, the lightning-like tongues of flame) and the giving of the Law on the Heart. As St. Thomas says in his treatment of the Old Law in the Summa, “the law of the New Covenant is nothing other than the Holy Spirit.” The Spirit is the Law written on the heart promised with the New Covenant (see Jer 31:31-34). Hebrews 12:18-24 is a must-read for the connection between the Sinai account and Pentecost! The pouring out of the Spirit makes the members of the Church into a Kingdom of Priests (Exod 19:5-6; see 1 Peter 2:9), a promise that was rejected by the Tribes at the Golden Calf episode, but is renewed to the Apostles and the other Israelites who heed their preaching in Jerusalem at Pentecost, and also to all us Gentiles who also partake in the same Spirit. Ezek 37:1-14. 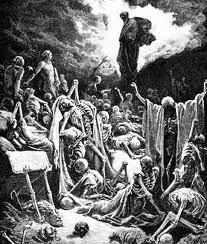 The Resurrection of the Dry Bones in Ezekiel’s Vision. The dry bones in this vision, at one level, represent the national hopes of God’s people Israel, which have “died” and been “scattered” by war, exile, and diaspora. At Pentecost, we see a remarkably widespread, representative group of Israelites from around the world, gathered together in Jerusalem and “reunited” or even “resurrected” as the New Israel through the blowing of God’s Spirit. They form the infant Church. Joel 3:1-5. The Outpouring of the Spirit in the Last Days. The connection of this reading is obvious, since St. Peter quotes it as being fulfilled during his sermon at Pentecost in Acts 2:17-20. The Psalm. Psalm 104, the great “Creator Spirit” Psalm, is the Responsorial for both the Vigil and the High Mass of the Feast Day. Verse 30 is used as the refrain: this verse is virtually the theme of the “decade” of the Spirit that we celebrate from Ascension to Pentecost. Psalm 104 celebrates God’s glory revealed in his creation, which is brought forth, maintained, and renewed by the Spirit (compare Genesis 1:2). At Pentecost, the Wind that blew over the waters of the young earth blows again over the believers gathered around the Apostles. The Church is the foretaste or first-fruits of the New Creation, since Christ’s resurrected Body is our food. As St. Paul says, “if anyone is in Christ, he is a new creation!” (2 Cor 5:17). This concept flows nicely into the Second Reading (Rom 8:22-27), where Paul refers to us as having “the firstfruits of the Spirit,” that is, already in a mysterious way participating in the Creation that is to come in the next age, a participation which as yet is denied to rocks, trees, petunias, and Labrador Retrievers. We have the “down payment” of the Spirit, yet we await a fuller experience of the New Creation which will come at the resurrection, when the rest of nature also will be renewed. and let him drink who believes in me. Translated this way, it is clearly Jesus’ heart that flows with rivers of living water. I think this division of the clauses makes better contextual, narrative sense as well as theological sense. Jesus’ Scriptural “quote” here is a paraphrase and summary of the vision of Ezekiel 47 and other passages from the prophets that foresee a supernatural river coming forth from the New Temple. 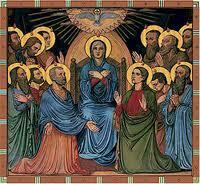 The Church sees in Pentecost the definitive realization of this vision. The River of the Spirit is the water of baptism, which conveys the Spirit to believers (Acts 2:38). Obviously, Jesus is speaking to the Apostles and disciples whom I assume had already been Baptized in the Sacrament of water and the Holy Spirit. However, the Church considers this episode as a reference to "Confirmation". It is here that the Apostles and disciples were empowered to teach the whole world (CCC 1302). This is when I began to wonder about the meaning of Hebrews 6:2 and the mention of doctrine of baptisms. Since both Baptism and Confirmation are outpourings of the Holy Spirit and since Christ calls both "Baptism", then why would it not be correct to call all the Sacraments "outpourings of the Holy Spirit" and therefore, Baptisms? In other words, the doctrine of Baptisms is the doctrine of the Seven Sacraments.